Are there magnetic properties in the replica of the Arch of Triumph? Do you remember when I had talked about the replica of the Arch of Triumph being a “sort of antenna” or a beacon for something other wordly? Well let me introduce you to the Casimir Effect. So you can see what exactly the Casimir Effect is according to that video. 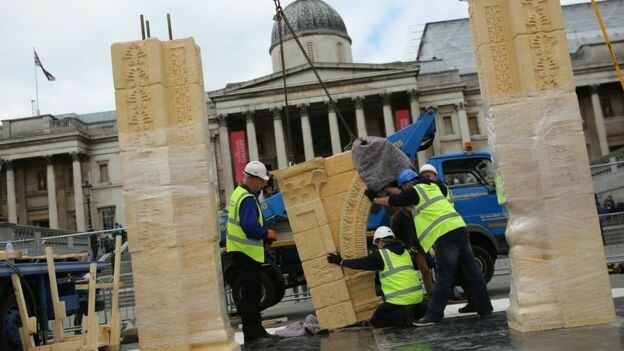 But what does it have to do with the Arch or statues made of marble? 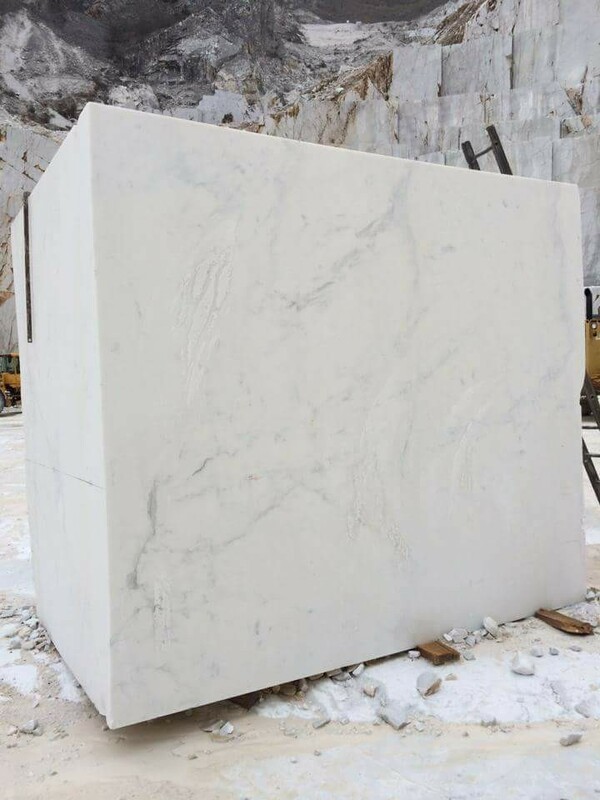 In short, the marble sends energy to a source and powers it. 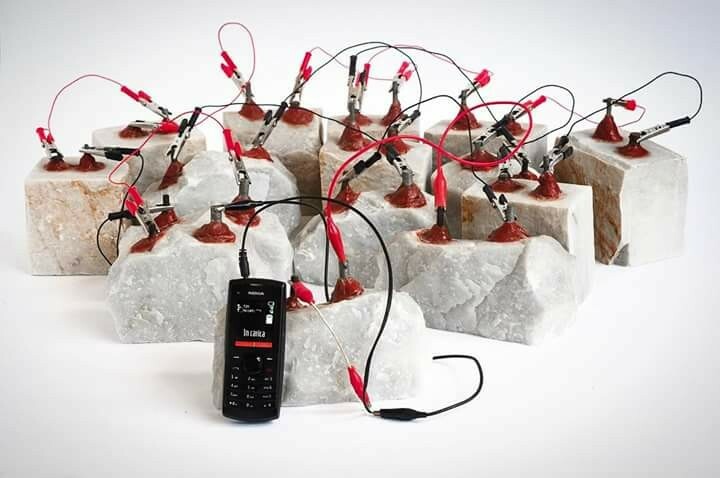 This marble with “conductive bars” in it acts as a device that will power lights, fans, clocks, you name it. Now I suggest you read the article below on the Casimir Effect exhibition but keep this Arch in mind. Like I mention, the replica of the Arch has been called an antenna by IDA’s Roger Michels and the Arch was made in a quarry in Carrara, Italy of Egyptian marble. So does this Arch carry these same properties as mentioned below and does their latest motto “Passing Through Moving Forward” have anything to do with its quantum properties. And notice the head that they call Aphrodite Energy. I believe this head is reminescent of the one they unveiled in New York for the Italian Consolate. Keep all that in mind. Please watch this video from Affiliati Peducci Savini. It shows the marble foot power a clock. 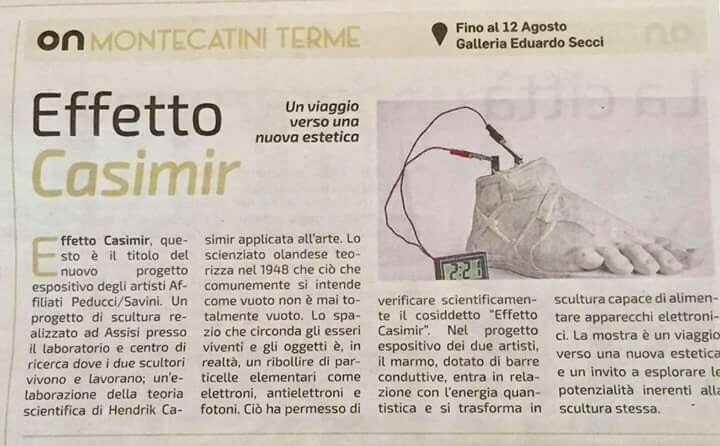 “Casimir’s Effect is the title of the new exhibition project by Affiliati Peducci Savini for the Galleria Eduardo Secci Contemporary in Florence , curated byValentina Gregori , and can be visiteduntil August 12th . A sculpture project made in Assisi at the laboratory and research center where the two sculptors live and work. In this place, a former pink stone quarry, sculpture is a science, constantly shifting the tradition inherited viewpoint. The recovery of ancient techniques for marble processing and parallel scientific research, see Affiliates as holders of knowledge now lost and innovative at the same time. 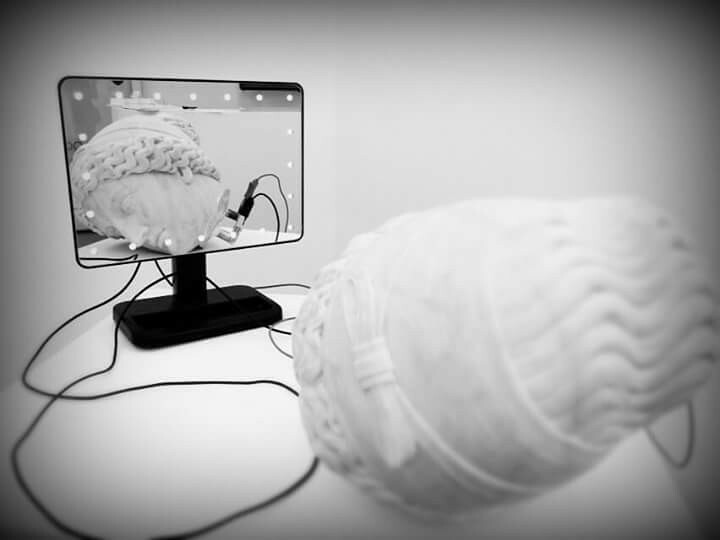 The project of the Affiliates Peducci Savini is a ‘Elaboration of Hendrik Casimir’s scientific theory applied to art . The Dutch scientist theorizes in 1948 that what is commonly understood as a vacuum is never totally empty. The space that surrounds living things and objects is, in fact, a flurry of elementary particles such as electrons, electrodes, and photons. This allowed scientifically to verify the so-called “Casimir effect”: that is, the presence of fluctuations in the electromagnetic field in the vacuum. 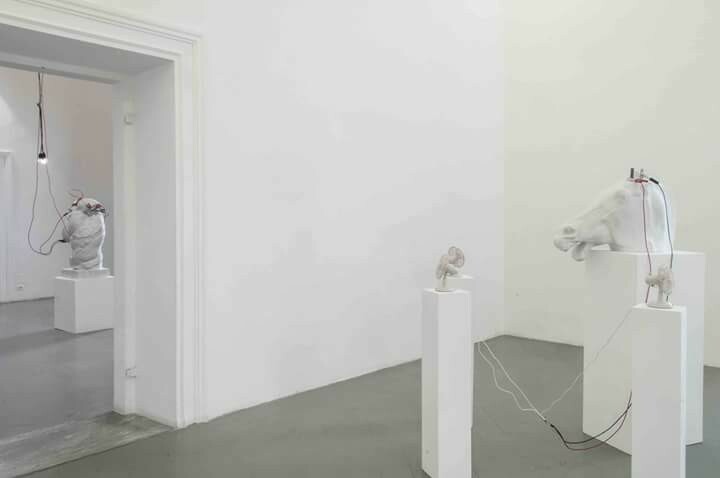 In the exhibition project of the two artists, the study of the zero point energy fluctuations is applied to sculpture and all theoretical complexity materializes in pure aesthetic vision. 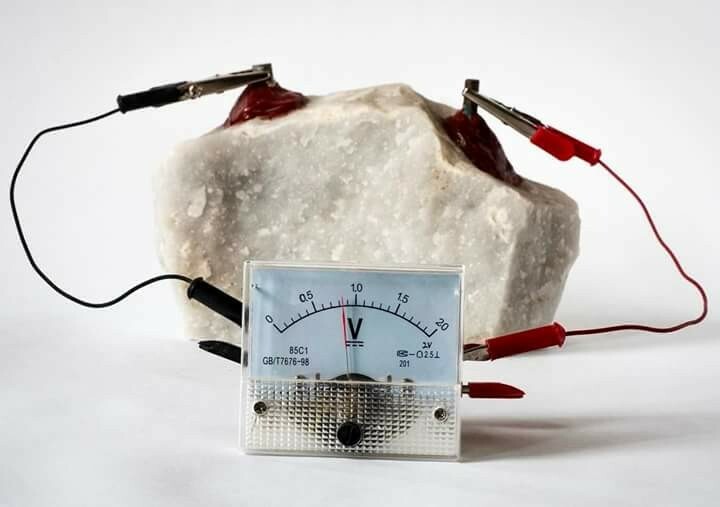 Marble, with conductive bars, connects with quantum energy and becomes a sculpture capable of powering electronic devices. The “Casimir Effect” is a journey to a new aesthetic and an invitation to explore the potential of the sculpture itself. The history of contemporary and contemporary sculpture has gone through many stages, and the path that has seen it clear from the canons of classical heritage has been complex and has no difficulty. In the attempt to trace the passages that lead sculpture to being “modern”, scholar Rosalind Krauss identifies in the work of Auguste Rodin, which from 1877 onwards is the starting point for a first change of language: sculpture descends from Pedestal to impose on the viewer’s point of view, it wants to show the process that determined it and no longer conceal it. The work of art asks to be experienced in the immediacy of its time and the new forms resulting from it do not seem to pre-exist in the collective imagination. Symbolically, here begins the long journey of sculpture in the modern world. Yet today, when thinking of marble sculpture, the first images that emerge from collective memory concern only a few and great protagonists of history: the first thought goes to the sculpture of ancient Greece, then suddenly go through the names of Michelangelo, Bernini And Canova. The marble carries with it a bag of precise references and meanings whose origin, though, seems to be placed in the myth. A constant challenge, a powerful material that over time has been faced, forcibly, interrogated, avoided. Sculpture research in the last two decades has given rise to a new tendency: to dissipate the very strength of marble, its weight, and to speak of lightness precisely through this compact and concrete material. This has led to a precise choice of subjects, seeing marble competing with true resemblance and simulation in aesthetic terms of objects linked to the most contemporary everyday life, a symbol of a “pop” culture. Sculpture seems to point to a strangeness of the work of art in order to return to the center of artistic or historical debate. One aspect, this, that the Affiliates Peduci / Savini reach by other means: they do not challenge the marble, they do not oppose its nature, but come into resonance with it and inform the sculpture of its history. Casimir effect is a journey towards a new aesthetic and an invitation to explore the future possibilities of sculpture. 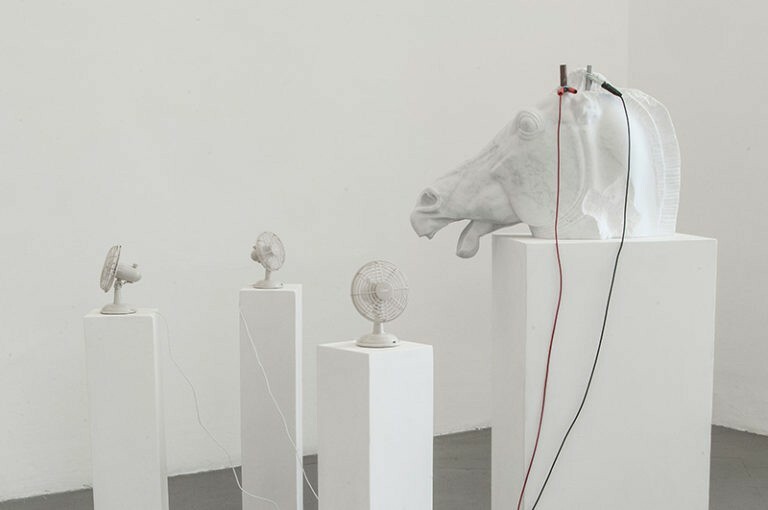 The scientific thinking that the Affiliates apply to art is the prerequisite for a new approach to the material from which a sculpture is derived which is no longer manipulated but “cultivated”. 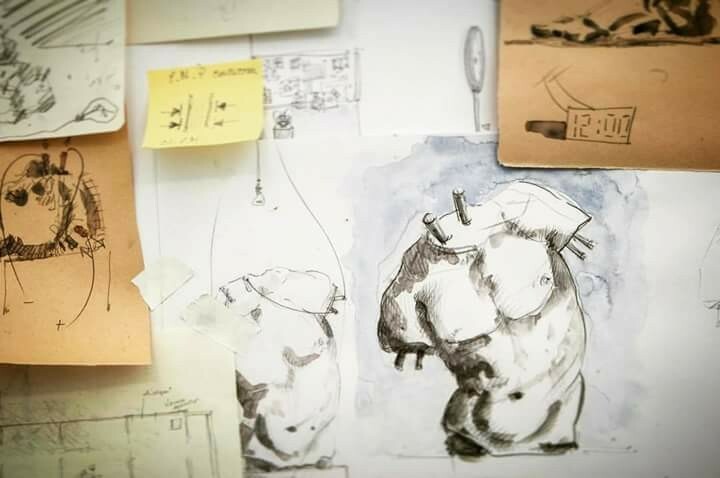 An artistic path deeply enveloped with the movements of nature and existence, capable of simply demonstrating what scientific research processes through formulas and calculations. In classical physics, empty space is a kind of inert container where nothing can happen. According to quantum physics, however, vacuum is never empty. Hendrik Casimir, wondering why fluids such as mayonnaise fluttered so slowly, in 1948 conducted an experiment: put two flat plates in the void, facing each other, realizing the presence of a pulling force exerted between the two. “Casimir effect”, ie the fluctuations in the vacuum of the electromagnetic field. If the vacuum is not empty, but it is a flush of elemental particles such as electrons, electrodes, and photons, what happens when this material infects the material? Here is some information on this exhibit that ran from July 12th to August 12th for 3 weeks. 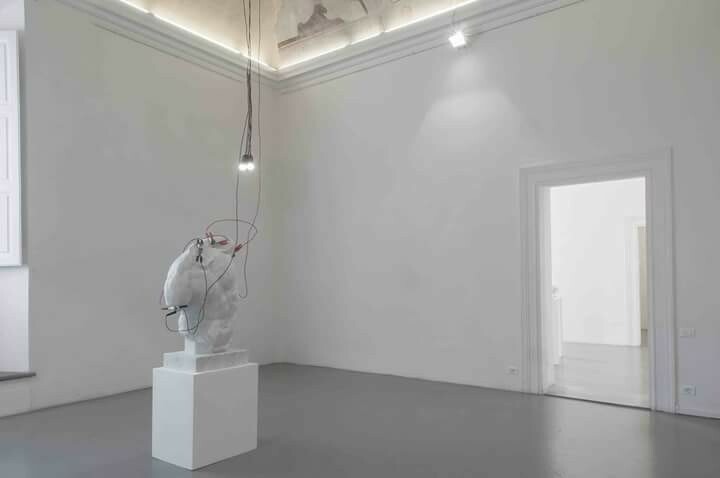 A new interpretation of the concept of sculpture and installation on stage at the Galleria Eduardo Secci in Florence , where the affiliated Peducci-Savini artists exhibit at an exhibition by Valentina Gregori , which runs until August 12, 2017. The association Peducci-Savini , born from the common passion for sculpture during the studies at the Accademia di Belli Arti di Carrara, is based on the same purpose: art must be a new knowledge, retrieving ancient techniques to interrogate on the daily and Improve our human condition. The first question that artists seem to ask in their research is: What does sculpture mean today? 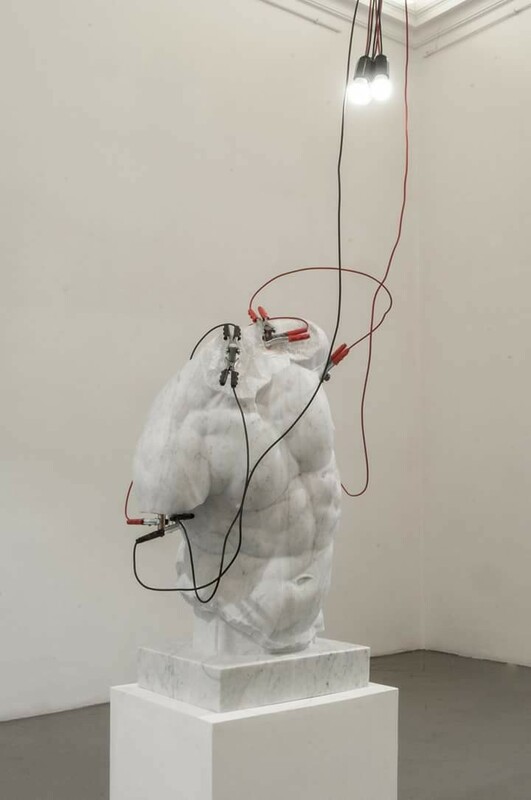 In their works, combine the marble and scientific-conceptual component. The result is a new aesthetic of sculpture that reflects multiple and hidden potentials of marble. The term ” Affiliates”Induces the will to welcome in their work the presence of other experts able to translate their way of doing art in other areas. This is evidenced by the close collaboration with the Normale University of Pisa. Their work is in turn subject to study as it is able to observe the scientific data under the artistic aspect. The Casimir effect is nothing other than the practical translation of the scientific theory enunciated by Dutch scientist Hendrik Casimir on the concept of vacuum: we can not speak of absolute vacuum because there is the presence of fluctuations in the electromagnetic field. 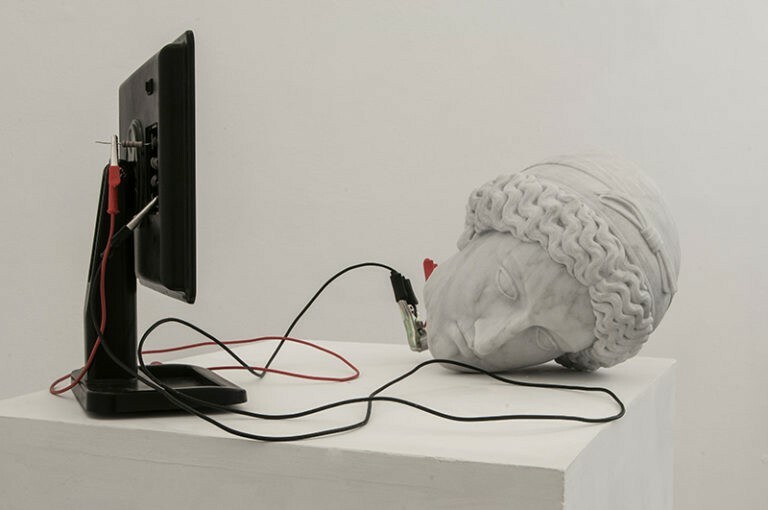 In the exhibition project marble sculptures are connected to conductive bars that, in contact with the energy of the surrounding space, are able to operate electronic devices. In the first room are displayed the works ” Aphroditeenergy ” and ” Kilometers Hours ” the first activates a mirror with led lights, while the second a digital clock. It is amazed by the brilliance of marble flowing in the different anatomic parts, respectively, the head and foot marking the beginning and end of the body, where mind and movement are visible. In the second room, the ” Fidia horseenergy ” work is impressive , the expressiveness and contraction of the horse’s face make the marble complexity, not easy to work, but the two sculptors able to shape as malleable. The energy of the material passes from sculpture to small fans in action. Exposure closes with Faun’schestenergy the facial torso in pure classical style, balanced in its bodily structure, thanks to the elegant white shiny white marble. Benefiting from the “empty” energy are two bulbs that overlook the work. Tradition and innovation are fundamental moments of their research. The need to survive the past arises from the desire to prolong the sculpture over time. Their Carrara marble works have no maturity, they are eternal, they constitute collective memory.